Marsha and Gary Bertrand were raised in a modest, small Illinois farming community of 1,400 people. 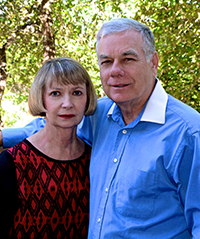 Today, the Austin, Texas, couple is committed to supporting young people in similar circumstances through gifts to their alma maters. “Education has been essential in our lives. Neither one of us could have accomplished our career goals without it,” Marsha says. While Marsha was in Carbondale, Gary was in the Air Force stationed in South Carolina serving our country. He enrolled at the University of South Carolina, completing courses at night toward his accounting degree. After college, Gary was in banking for 10 years, and subsequently purchased a Chicago-based company that specialized in glued magazine inserts for publications such as Time, Newsweek, and Readers Digest. He sold his company in 1994. The couple is striving to make their respective alma maters beneficiaries of their good fortune. The Bertrands recently presented SIU with $1 million to establish the Bertrand Foundation Scholarship Endowment. Awards will be presented after the endowment generates earnings (they are doing the same for University of South Carolina) and they have made provisions to support SIU through a deferred estate gift. The Bertrands, high school sweethearts who will celebrate 44 years of marriage in October, say education set the tone for their success. Gary says his college experience had a similar impact on him. For more information on how to establish an endowment through the SIU Foundation, visit www.siuf.org. Also, for details regarding deferred gift options, visit our new gift planning website at: www.siufgiving.org, or e-mail: giftplanning@siuf.org.